Adding contacts manually to your Samsung Galaxy S 4 involves taking an existing contact database and entering its entries to your phone, one profile at a time. (This option was the only option for phones back in the day.) 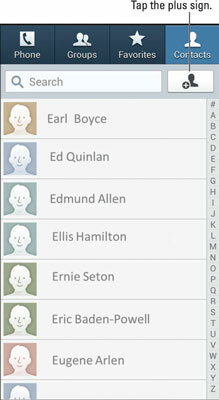 Consider this your last resort since your smartphone offers you so many easier ways to add contacts. But at times, it may be necessary. Tap the + (plus) sign. A screen with text boxes appears. This is the profile for the contact. Fill in the information that you want to include. This screen has defaults. For example, it assumes that you want to add the mobile phone number first. If you want to add the work or home number first, tap on Mobile to change the field description. If you want to add a second telephone number, tap the little green plus sign, and another text box shows up. When you are done entering data, tap Save at the top of the screen. The profile is now on your phone. Repeat the process for as many profiles as you want to create.